Pleasantville Secondary retained the Shell/First Citizens Bank Girls National Big 5 title in Plymouth today, after a 2-0 win over Signal Hill Secondary. For coach Joel Maloney and his charges, it is a pit stop on the way to their ultimate goal: a clean sweep of Secondary School Football League (SSFL) trophies. Pleasantville and Signal Hill were both unbeaten at kick off. Prior to today, “P-ville” played seven times this season with as many victories and an incredulous tally of 99 goals for and one against, while Signal Hill had 80 goals for and one conceded from their 12 outings. 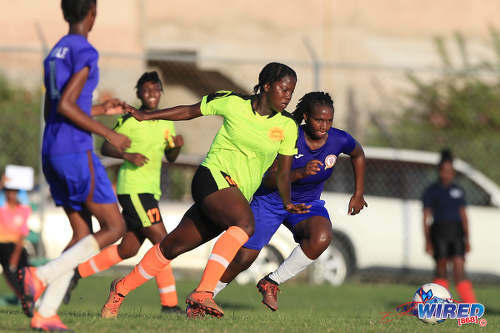 Only the South Zone team got on the score sheet today, though, as Alexcia Ali and Chrissy Mitchell struck on either side of the interval to settle the affair. Maloney said Signal Hill were easily the toughest opposition his team faced this season. Maloney identified Signal Hill left winger Jelese Alexander and forward Celine Loraine as their main threats and adjusted to suit, with his own winger, Mitchell, switching flanks to do a defensive job on Alexander. Pleasantville custodian Akyla Walcott was busier than usual as the home team had their moments. But, once again, P-ville prevailed in the end. 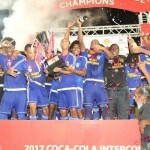 Last year, Pleasantville swept the National Big 5 crown as well as the South League and Intercol trophies before being stunned by Bishop Anstey High School (Port of Spain) in the National Intercol final. It was was the closest they had ever come to a perfect season. In 2018, Maloney hopes to go one better. 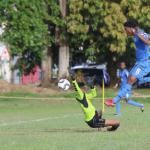 “The girls are really excited about the victory,” he said, “because our mission was to win the South Zone, retain the Big 5, retain the South Intercol and we are pushing for the National Intercol as well. 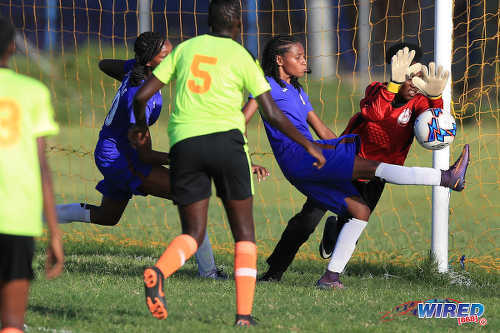 The 2018 Coca Cola Girls Intercol tournament kicks off on 11 November with Signal Hill returning to action to face zonal opposition in Tobago. 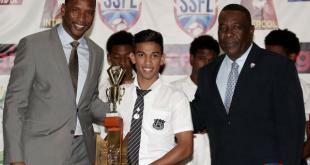 Pleasantville are scheduled to play their first match at the South Zone semifinal stage on Thursday 15 November. 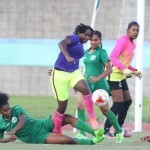 Pleasantville Secondary: 1.Akyla Walcott (GK), 4.Shackeme Buntin, 6.Shawnelle Rose, 7.Latifha Pascall (captain), 8.Jasandra Joseph, 9.Alexcia Ali, 10.Aaliyah Pascall, 11.Chrissy Mitchell, 12.Kayla Garcia, 14.Curissa Joseph, 18.Jhaney Simon. Substitutes: 22.Jerica Braxton (GK), 2.Dalisha Brawthaite, 5.Corysa Joseph, 13.Amelia Thomas, 15.Ariel Stoute, 16.Celine Hypolite, 19.Kimberly Stewart. 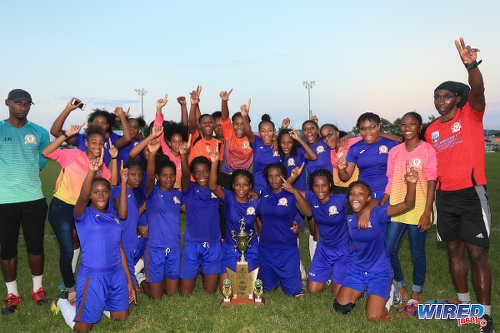 Signal Hill Secondary: 1.Aaliyah Alvarez (GK), 2.Shenelle Osbourne, 4.Jelese Alexander, 5.Derisha Bristol, 9.Avonelle Loraine, 11.Celine Loraine, 13.Tyra Meyers, 15.Dilleasia Nicholson, 16.Dominique Scott, 17.Ashante Campbell (captain), 18.Twinkle Thomas. Substitutes: 3.Mikaila Joseph, 8.Salatina Seales, 10.Gamelia Waldron, 12.J’nae Harris, 14.Gamie Waldron, 19.Ariel Adams, 20.Kristiana Gibbes. Photo: Pleasantville Secondary head coach Joel Maloney (far left) and assistant coach Brian London (far right) celebrate with their players after their 2-0 win over Signal Hill Secondary in the National Big 5 final at Plymouth on 4 November 2018. 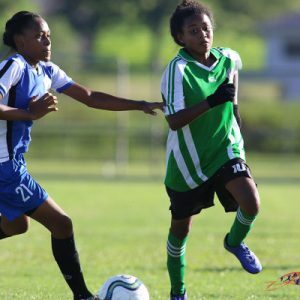 Signal Hill 0, Pleasantville Secondary 2 (Alexcia Ali 40, Chrissy Mitchell 58) at Plymouth, Tobago.